Cris Cofitis was born in Athens, Greece in 1962. He studied technology engineering at A.D.K.T.S.A from 1978 to 1981. Also studied fashion design from 1990 to 1993, at the Institute “VELOUDAKI” where he graduated with excellence. He worked in several different areas such as jewelry design and fabrication using silver and bronze, furniture design and production, as well as, in fashion, accessories and advertising industry fields. He has also experimented in sculpting engineering using recyclable materials (metal, wood, acrylic, glass, resin, stones & leather) creating handmade, authentic collector’s item artifacts, combining art & design as an endless game between fantasy and motion. Cris Cofitis, inspired by planet movements, provided his sculptures with the effect of “motion”, through changing positions, shapes and colors, supported by special dedicated multiple direction lighting applications. His collection has been enhanced in the meantime with custom made motorcycles, scooters and special parts on demand. He has worked with some well-known businessmen and artists, creating for them a long list of custom made designs, sculptures, clothes and jewelry. He was awarded with many distinctions in National competitions such as INTERSHOW, TEXTILIA in 1991 - 1992. He won the 1st award as the best Greek designer and the 4th award worldwide among 60 countries and 240 participants, at the World Competition for young designers in Paris, sponsored by UNESCO. On January 2011, he established Pulsar Project® and August of same year he participated in the AMD World Championship for the best custom made motorcycle, in Sturgis South Dakota - USA. Candidate with a unique motorcycle project called “Chimera”, designed and fabricated by him, won the 18th place in free style class among 80 other competitors. 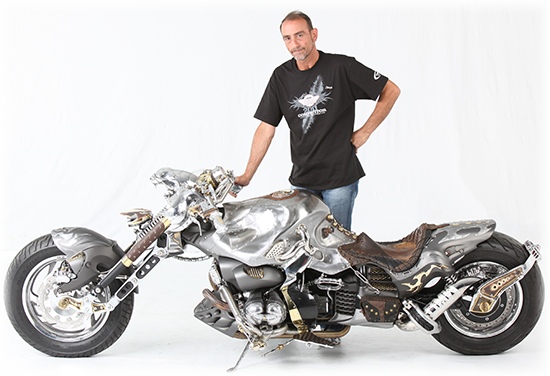 On April 2013, after an invitation from the German Company SIP, specialized manufacturer of accessories and parts for Vespa and Scooters, he won 2 awards for his “Steampunk” Vespa design called “Springer Sting”, also an exclusive handmade creation by him. He is also the creator of the Steampunk Vespa called “Guardian” that is the most well-known Vespa on the internet scooter & customizing forums.